Our Reply:Good afternoon, Please accept my apologies for the delay in someone getting back to you. I can see that our installations senior contacted you today regarding your query and offered a resolution for you. Should you have any further queries, please do not hesitate to contact us again. Thank you for leaving feedback on the item, we do take these feedbacks seriously - good or bad. I hope that you will continue to enjoy your purchase for many years to come. Our Reply:If you could call our customer service team and let them know about the problems they will be able to help rectify them. Review:Bought as a playhouse for our 7 year old granddaughter. She loves it. So do her friends. Our Reply:I am pleased that your granddaughter is enjoying your purchase with her friends. Review:So far so good but due to the weather it hasn't been assembled yet so it would be unfair to give it anything other than this star rating at the moment. 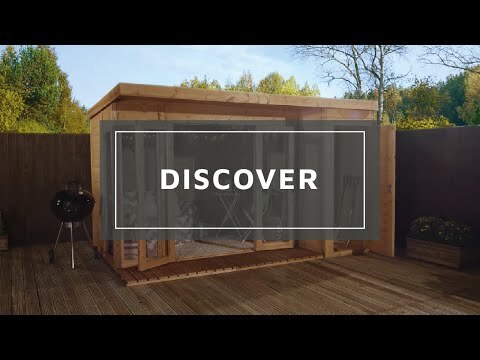 We hope you enjoy using your Vermont Summerhouse, do let us know how it looks when you get chance to assemble! Review:See previous entry for my comments. It is great knowing that you are highly satisfied with both the product and service we have supplied and I thank you again for your feedback. Review:Yet to put it up but individual parts look of good quality. I am glad you are happy with your summerhouse so far and I am sure you will be more so, once the erection is complete. I am sure you will have many happy years of use from it and I thank you again for taking the time to offer your feedback. It's great knowing that you are so happy with the level of service we have provided and that you are happy with the quality of your summerhouse. I am sure you will have many happy years of use from it. Thank you again for your feedback. I am delighted to hear that you're so happy with the Summerhouse. I hope that it remains the focal point of your garden for many years to come. Review:Love my summer house - it is as expected and nothing at all to complain about but doors need a little manipulation when opening and closing. I am thrilled that you are so pleased with your summerhouse overall and if you have any queries I can assist with, please contact me on either 0800 029 1000 or service@waltons.co.uk. Thank you again for your positive feedback. Review:The summerhouse is not bad quality for the price paid but I strongly recommend upgrading the roofing felt. I am glad that you are happy with the quality of your summerhouse and thank you again for your great review! I am very glad that you are pleased with the quality and value for money of your summerhouse and I am sure you will have many happy years of use from it! I am thrilled to know that you are very happy with the service and value for money of your summerhouse and I thank you for your great feedback! Review:The Summerhouse was very good value and I wasn't sure what the quality was going to be like, but I was pleasantly surprised when it arrived. I am very pleased to know that you are so happy with the quality of your summerhouse and I am sure that you will have many happy years of use from it. Thank you again for your positive feedback - it is much appreciated. Review:Quality product best prices ! I am thrilled to know that you are so pleased with the quality and value for money of your summerhouse and I am sure you will have many happy years of use from it. Thank you again for your feedback! It is much appreciated. Review:Very pleased with product, looks really good in garden and very roomy. It is wonderful that you are happy with the quality of your summerhouse and I am sure that you will have many happy years of use from it! Thank you again for your feedback. Thank you for your feedback and for taking my call earlier, please accept my apologies again for the issues you have experienced with your order. As discussed as soon as we have received your images we will offer a resolution for you. Thank you again for your feedback. Review:Great summer house. Relatively easy to construct. Looks really well in the garden. Roof support pole needs to be stronger though. I am so pleased to know that you are happy with the quality and appearance of your summerhouse and that assembly was straight forward. We take your comments on board and I thank you again for taking the time to provide us with your feedback. Thank you very much for your feedback and for sending an image of your new building! Review:Well it was 3 stars, but the form just wiped so I've got to start again. Emailed them several times about an add-on item. They were vague and would not give a price, but eventually agreed to add it to the order. They didn't. Review:Good price for a summerhouse, very sturdy. It is great to know that you are happy with the value for money of your summerhouse and I thank you again for your feedback - it is much appreciated. Review:Generally, the product is good but with some issues which could be improved. As described above, one of the side windows wasn't fixed properly with a dangerous protruding nail, and the doors weren't finished properly with rough sawn timber. Review:The summerhouse is reasonable for the money spent. The Waltons installation lets it down, handles not level, cracks where hinges screwed in, doors don't fold back properly, holes in wood. Review:Very good product well made. Thank you for taking the time to write us a great review! I am so pleased to know that you are extremely pleased with your summerhouse and I am sure you will have many happy years of use from it.